About "Admiral of the Ocean Sea"
Samuel Eliot Morison was born in Boston in 1887. He received his Ph.D. from Harvard in 1912 and began teaching history there in 1915, becoming full professor in 1925 and Jonathan Trumbull professor of American history in 1941. He served as the university's official historian and wrote a three-volume history of the institution, the Tercentennial History of Harvard College and University, which was completed in 1936. Between 1922 and 1925 he was Harmsworth professor of American history at Oxford. He also was an accomplished sailor who retired from the navy in 1951 as a rear admiral. 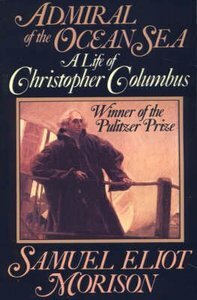 In preparing for his Pulitzer Prize-winning biographies of Christopher Columbus and John Paul Jones, Admiral of the Ocean Sea (1941) and John Paul Jones: A Sailor's Biography (1952) he took himself out of the study and onto the high seas, where he traced the voyages of his subjects and "lived" their stories insofar as possible. When it came time for the U.S. Navy to select an author to write a history of its operations in World War II, Morison was the natural choice for the task. In 1942, Morison was commissioned by President Franklin Delano Roosevelt to write a history of U.S. naval operations in World War II and given the rank of lieutenant commander. The 15 volumes of his History of United States Naval Operations in World War II appeared between 1947 and 1962. Although he retired from Harvard in 1955, Morison continued his research and writing. A product of the Brahmin tradition, Morison wrote about Bostonians and other New Englanders and about life in early Massachusetts. He was an "American historian" in the fullest sense of the term. He also had a keen appreciation for the larger history of the nation and world, provincial is the last word one would use to describe Morison's writing.